Famed bonsai expert Yoichi Nakanishi will give workshops on the care of bonsai on September 11 and 12, 2013. A Bonsai exhibition and workshop will be held at Central Plaza Chiang Mai Airport Shopping Center on September 11 and 12, 2013 and lovers of this beautiful art form are invited to attend this free workshop, materials costs will be collected at the exhibit. This 50 year old kuromatsu or Japanese black pine bonsai will be on display at the exhibit. Bonsai is an important and authentic part of Japanese culture and an example of fine Japanese craftsmanship. The exhibition, which is being held by the Japan Foundation, Bangkok, in cooperation with Daikokuya, will display the creativity and unique aspects of Japanese aesthetics. 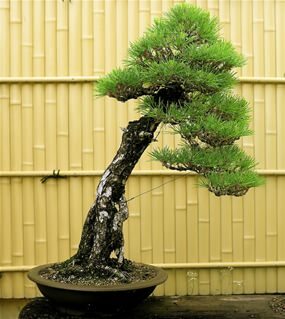 In collaboration with Thai bonsai lovers, kuromatsu or Japanese black pine, the king of bonsai, which was born in Japan and then transferred to Thailand, will be on display. The bonsai workshop will be held for bonsai lovers to gain hands-on experience of caring for bonsai under the expert guidance of Mr. Yoichi Nakanishi, the fifth generation owner of Nakanishi Chinshoen (bonsai garden) in Oninashi, a famous kuromatsu production site in Takamatsu, Kagawa Prefecture, Japan. The exhibition will be held on the 2nd Floor of Central Plaza Chiang Mai Aiport Shopping Center on September 11 and 12, with workshops being held at 2 p.m. and again at 4 p.m. Material fees of 1,500 baht will be collected at the workshop. Ms. Nojima ([email protected] for reservations. Sharaku’s art as graphic design. Lisa Moses uniquely beautiful creations will be on display from September 14 at 116 Art Gallery. Lisa Moses will be exhibiting her latest cast acrylic collage prints at the 116 Art Gallery on Charoen Muang Road from September 15 – October 31, 2013. This Chiang Rai based artist uses a unique technique that was invented by her father, Joseph Zirker, in the United States. 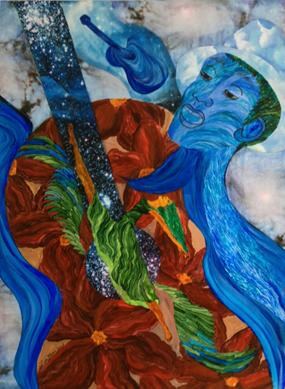 For many years her work has engaged in a play of relationships between art, our earthly world, the sky, and the infinite galaxies. Her art stretches our imaginations with her brilliant colors and inventive topics. The cast acrylic print works of Lisa Moses are created by a unique process. Using a polyethylene plate, she layers paint and collage elements to create one-time prints with smooth surfaces that fully integrate the collage elements. The resulting work has distinct vibrant colors and composition. It incorporates the beauty of the galaxies, humanity, and the music and dance of life forms on earth. The opening reception for the exhibit will be on September 14 at 6 p.m. when Lisa will be on hand to describe this unique style.